Public perception and concern that increased CO2 is elevating global temperatures has resulted in a national emphasis to replace fossil fuels and coal with clean renewable fuels to supply our future energy needs. The Alabama Forestry Commission believes that using woody biomass to produce heat and energy will not only offset CO2 buildup, but will also improve Alabama’s economy and keep our forests healthy. 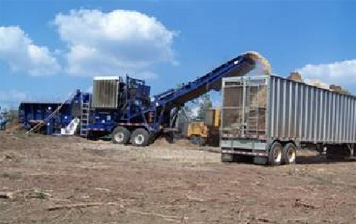 Woody biomass is a renewable product typically left in the forest during harvests or produced as manufacturing waste products. This material is typically called fuelwood. Using some of this material will not only help replace fossil fuels with renewable fuels, but will also reduce the risks of destructive wildfires, insects, and disease, and have increased capacity to support wildlife. When fuelwood is burned it generates lower levels of hazardous emissions than traditional fuel sources. Decide if there is a need to replace an existing energy system or install a new system. Contract with local woody biomass suppliers. Long-term contracts are desirable where considerable volumes will be purchased. The Alabama Forestry Commission maintains a listing for loggers and vendors. The Agency also maintains forest resource availability information and can analyze the resource availability within a radius of potential site locations. Purchase the system. Have the manufacturer install the system ‘turnkey’. Track all costs, fuel usage, energy output, and other required information in order to claim any available tax credits (non-governmental entities). File for tax credits if available.